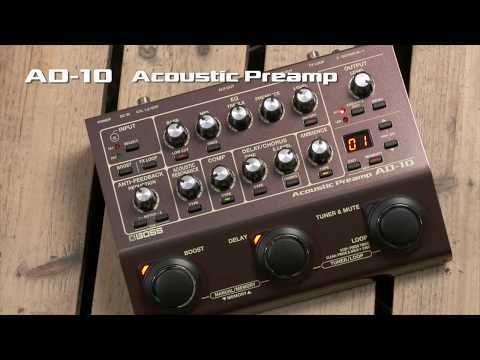 The BOSS AD-10 Acoustic Preamp Pedal is the perfect tool for those who want a versatile footswitchable preamp/DI that retains the rich timbre of your electro-acoustic guitar. The dual channel unit boasts deep editing capabilities, flexible connectivity, sumptuous BOSS effects, a looper function with a generous recording time, and modest dimensions to make it easy to transport between gigs and the studio. The BOSS AD-10 boasts Acoustic Resonance technology, which restores the full acoustic timbre of your guitar in all its glory. By carefully analysing the pickup signal, the AD-10 recreates the missing body and strings resonance lost by some pickups, and generates a sublime infusion of tones. The result is a more powerful performance thanks to a truer representation of your guitar. Whether you're taking to the stage or hitting the studio to do some recording, the AD-10 is the perfect multi-tool kit to get the job done in style. As noted above, your acoustic tone sounds richer thanks to the Acoustic Resonance technology, whilst a plethora of additional functions eliminates the need for additional equipment. Not only that, but it can be powered using the included AC adapter or batteries, so that the unit can be as mobile as you are. Unwanted feedback can ruin a flawless performance, which is why the BOSS AD-10 Acoustic Preamp Pedal is equipped with an advanced processing engine to prevent it from occurring. The AD-10 juggles suppressing feedback frequencies with ensuring a balanced response to ensure that the richness of your sound is not lost. The BOSS AD-10 has two input channels, which enables you to set up a pair of guitars, use two pickup sources from a single instrument, or use two separate instruments simultaneously. Each input has independent EQ controls, as well as a variable low-cut filter, to ensure that each channel can be adjusted to suit your needs. As one would expect, the AD-10 is home to BOSS' peerless effects technology, with compressor, dynamic processing, reverb, delay, and chorus all just a button's push away. Control couldn't be easier thanks to the intuitive layout, for example you can craft a cool rhythm tone then hit the BOOST function to seamlessly cruise into a sweet lead tone. The built-in looper function offers up to 80 seconds worth of recording, so that you can lock in a rhythm loop whilst soloing over the top. The tuner ensures that no matter what tuning you need to be in, you are always sound perfect. The rear panel of the AD-10 is host to stereo XLR jacks to offer a DI feed to the PA, with stereo 1/4-inch jacks for monitoring or sending a feed to your amplifier. Channels can be assigned to independent outputs with pre- or post-effects options available. There is an effects loop for external effects units, a jack for connecting two footswitches or an expression pedal for the looper function, volume, tap tempo, anti-feedback scan, and so much more. As if all that wasn't enough, the two-in/two-out USB audio interface enables real-time recording to your DAW of choice. As you can see, the BOSS AD-10 Acoustic Preamp Pedal in the all-in-one solution for performers and recording artists who demand the best.